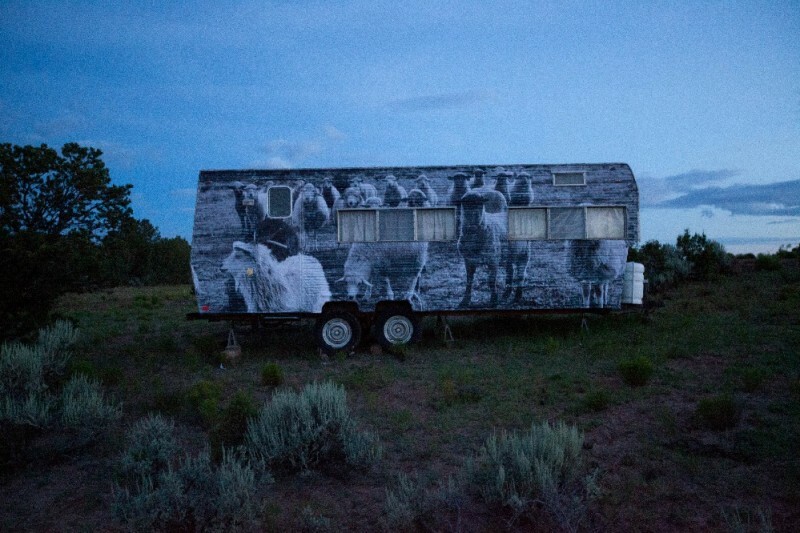 Mission Statement: The Painted Desert Project connects public artists with communities through mural opportunities and youth arts education on the Navajo Nation. For more information go to www.jetsonorama.net. the painted desert project is rolling forward. plans are underway to partner with a youth group in pinon, work with artists locally, nationally and internationally. anything you can contribute to the cause is appreciated. Thanks so much Nancy Marcus! thanks so much for the donation roberta zur! I trust you're well. Suffice it to say that Season 3 of the Painted Desert Project was absolutely amazing! I feel like the project moved to the next level. The project has always focused on creating art that is culturally sensitive and of benefit to roadside vendors by creating engaging work that brings people to the roadside vendor's stands. This season the project felt more like community service and the relationship with the community became deeper as evidenced by the work of Doodles and Monica Canilao who were here July 10 - 20. For those of you who don’t know, Doodles painted a food stand for Mrs. Woody in the first summer of the Painted Desert Project which lasted about 18 months before the stand burned down. This summer he and Monica rebuilt and painted a new stand for Mrs. Woody. Doodles and Monica worked on Mrs. Woody’s food stand at my house. Mrs. Woody and her family came over to my house daily (prior to this they'd never been to my house), to assist with painting and to bring food. They established a relationship with Monica and Doodles which is ongoing via Facebook and Instagram. While Doodles was one of the first participants in the project in 2012 and was the first to return this summer to pursue a project, he returned last week to visit with the Woody's and to assist Lunar New Year, Avant Gardener and Jaz on a wall in Kaibeto. The building that was painted by Lunar New Year, Mata Ruda, Jaz, Avant Gardner and Doodles in the small, reservation community of Kaibeto (population 750), was part of the old Bureau of Indian Affairs school system from the 50s to the 70s having fallen into disuse in the 70s. With the new murals the building received the community plans to covert it into a youth center. July 24 - August 2 the project hosted Troy Lovegates and Labrona from Canada. This was also Labrona's second trip to the Navajo nation as he was also in the first group of artists who came out in June of 2012. Their efforts were focused on the small community of Rocky Ridge where a water tank was painted. They also painted in Antelope Hills. (Unfortunately, Troy Lovegate's mural was found to be offensive by members of the community which they buffed.) We were hosted in Rocky Ridge by the family of Louise Shepherd where we spent the night in a traditional hogan and ate food fresh from Louise's garden. In fact, everything we ate at Nizhoni Farms had been grown or raised there. 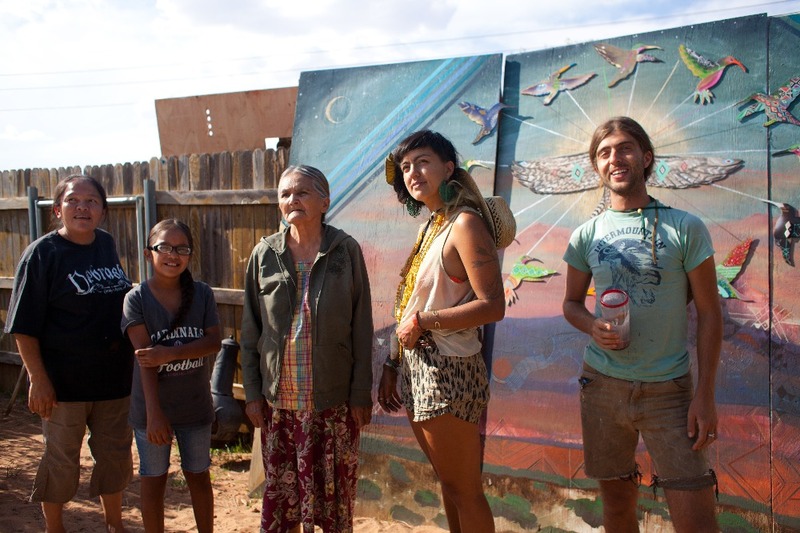 September 14 - 21 - Jaz was here and painted a mural in Kayenta, Arizona on the Navajo nation close to Monument Valley. Moved by the plight of wild horses that the Navajo nation is rounding up to slaughter because they are starving due to overgrazed pastures, Jaz painted horses escaping capture. The title of his piece is "Horses with No Names." Food was catered by Mrs. Woody and her family. September 23 - 30 saw Hyuro here for only her second mural opportunity in the US. Like Jaz, she is from Argentina originally but currently lives in Valencia, Spain. Having processed the experience of getting work buffed at Living Walls in Atlanta in 2012 she stated she's becoming more comfortable now with going to a community without a preconceived idea of what she'll paint and to have her work reflect more of her experiences in that community. Moved by the simplicity and beauty of the traditional Navajo morning prayer, Hyuro painted a female figure facing the rising sun and illustrated the movements of this prayer on the side of a bulding in Kayenta. The title of her piece is taken from the last line of the prayer and is called "In Beauty it is Finished." Photos of all the murals will appear on my blog soon ( www.jetsonorama.net) and the Facebook page ( www.facebook.com/thepainteddesertproject). Most importantly, thank you so much for your support in this project which is about building community. Without you as my community, Season 3 wouldn’t have been a success. Alex Maloutas suggested I donate to this great cause! Thank You for ALL the work you do. I am an aspiring Physician Assistant and intend on becoming a Health Scholar to specifically work among our Native American ancestors, and become as great as you are. You, Sir, are a True Renaissance Man ! Your work drawing attention to the human and environmental costs of uranium mining is inspiring and urgently needed. I love what you are doing. The images are so full of life and respect and love. Coast to Coast Photo thanks Marilyn and Dean Kimbrell for the donation. Coast to Coast Photo is proud to support The Painted Desert Project.